Today I’m going to introduce you to ppyeo-haejangguk, or ox bone hangover soup. This soup is made from boiling ox bones for hours and hours until all the delicious, nutritious meat, marrow, and ligaments dissolve and create a hearty bone broth. The resulting soup is rich, savory, earthy, and best of all, after one spoonful I can feel my lips stick together from the collagen. I think: “Wow this is good for my body,” which makes me enjoy it even more. That means it’s well made! 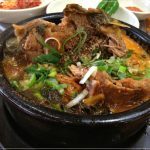 This kind of soup is very nutritious and good for you, and Koreans of all ages eat it to improve their health. I usually start by making a huge big pot of ox bone broth. I don’t measure anything, I just add as many bones as I can, and keep boiling and adding water until all the bone marrow has come out and I’m satisfied with the milky color of the broth. Usually by that time the bones are white and look like airy sponges! Then my family and I eat this for one week, usually as seolleongtang. But by the end of the week, for a bit of variety, I’ll make this haejangguk with the broth. Because of the doenjang (fermented soybean paste), it kind of tastes like doenjangguk, but with a richer flavor. Haejangguk (hangover soup) is a type of Korean soup that is steamy and hearty. It doesn’t mean you need to have a hangover to eat it, but that kind of soup is a good thing to eat when you’re not feeling well. It’ll make you feel better and fill you up! 2 pounds of sliced ox bones are $5.00 in the US, and that feeds 4 people. It’s a cheap but nutritious and delicious soup that everyone will love. Wash and rinse the bones in cold water to remove any bone fragments. Soak them in cold water to remove any blood. Boil 6 quarts of water in a heavy pot over high heat. 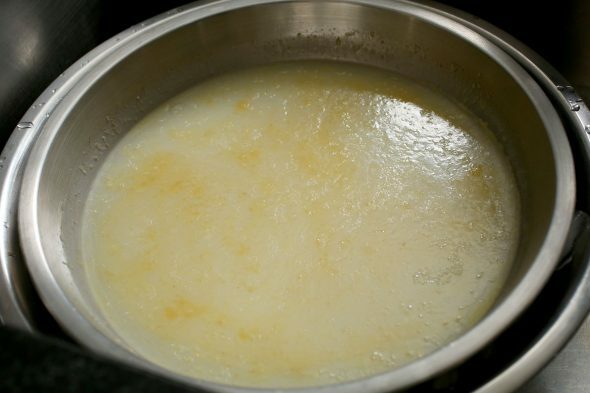 When the water boils vigorously, drain the bones and add them to the boiling water. Cover and lower the heat to medium and let it boil for 4 hours. Check the amount of broth. If it gets below 6 cups, add more cold water. Boil longer until the broth is nice and milky and you still have at least 6 cups of broth. Remove from the heat. Strain the bones to separate from the broth. Let the bones cool down until you can handle them, and remove any ligaments or bits of meat left on them. Keep the bits in a bowl. Let the broth cool down. Keep it in the fridge for several hours or overnight until it solidifies. If you can’t wait that long, you can fill a large bowl with ice and cold water, and set your bowl of broth on top of it. Change the water and ice one time. Your broth will end up cool and wobbly. You’ll see a layer of brownish yellow fat has solidified on the surface, skim it off with a spoon. If you have a pressure cooker, you can use it instead of boiling bones in a pot for hours. 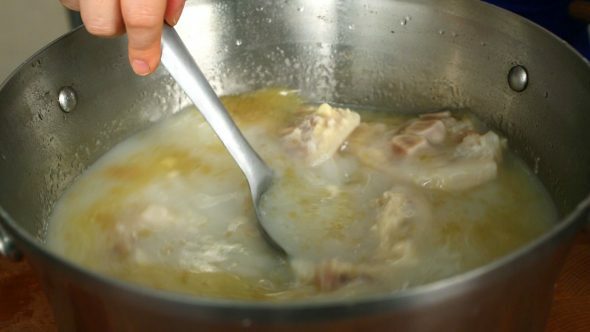 Simply cook the bones in your pressure cooker with 10 cups of water for about 30 minutes. Let it cool down. 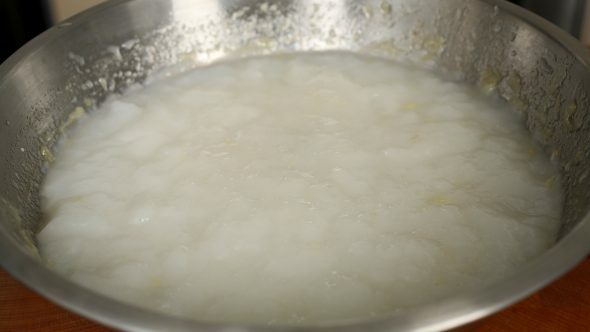 Skim any solidified fat off the top, and then put it in a pot with some more water and boil over medium heat until the broth is milky. Add more water as needed, until you have 6 cups of milky broth. 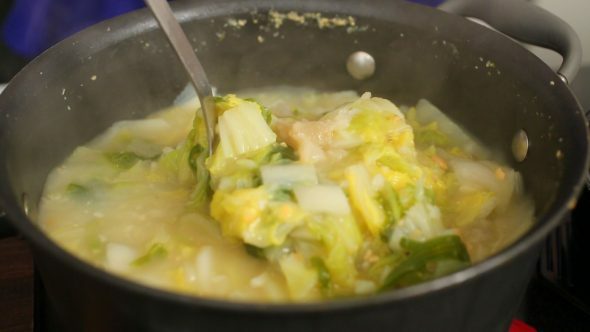 Bring a large pot of water to a boil and blanch the cabbage for 5 minutes. Strain and rinse in cold water a couple of times to remove any dirt left. Strain the cabbage and chop up into small pieces. 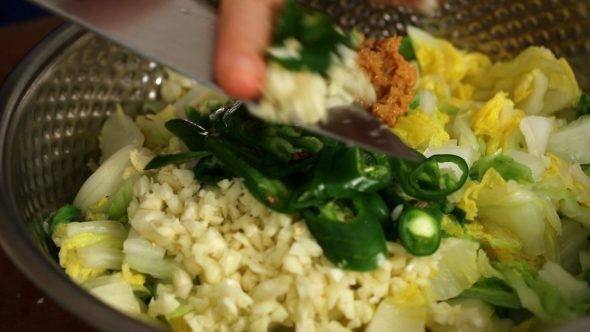 Combine the cabbage, doenjang, garlic, green chili pepper, and fish sauce in a bowl and mix it well by hand or a wooden spoon. Put the cabbage mix to a large pot with 6 cups of bone broth along with the leftover bits of ligament and meat. Cover and cook for 20 minutes over medium high heat. Turn down the heat to low and cook for another 10 minutes. Ladle the soup into bowls. Sprinkle chopped onion over top. Posted on Thursday, June 16th, 2016 at 9:38 pm. Last updated on July 7, 2016. Posted March 2nd, 2019 at 7:13 am | Log in to reply. Posted February 7th, 2017 at 8:37 am | Log in to reply. 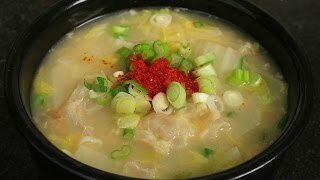 I lived in South Korea for 11 years and since moving back to Canada, I’ve really been craving 뼈다귀해장국 but I’m looking for a recipe for the spicy version, like this one where it has napa cabbage and maybe a couple of other veggies but is nice and spicy! Is there any chance you could post a recipe for this version? Posted February 8th, 2017 at 2:34 am | Log in to reply. I’m happy to hear that you are enjoying my cookbook recipes. Thanks! Posted February 8th, 2017 at 7:36 am | Log in to reply. Posted February 1st, 2017 at 10:40 am | Log in to reply. Is there a spicy way to make this soup? Posted December 19th, 2016 at 10:09 pm | Log in to reply. I was wondering if anyone has tried making this in a slow cooker. I was curious to know how it turned out and, if it turned out well, how much water to use. I think I might start experimenting! This looks delicious (as all your recipes do, of course! ), can’t wait to try it! :) Thank you Maangchi! Posted July 28th, 2016 at 11:15 am | Log in to reply. Can I use pressure cooker to make the broth? Would that effect the taste? Thank you! Posted July 6th, 2016 at 12:32 am | Log in to reply. I’m so grateful for your recipes! I’m mixed French-Korean, now in the US, and my friends recommended your site to me. My Korean grandmother passed away almost a year ago, and the one-year anniversary of her passing is almost here. She was from Gwangju and a terrific cook (like all Korean moms are :) but never wrote down her recipes. 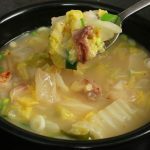 I had really struggled with how to make 설렁탕 bone broth with that milky white color like she had done… until I found your recipe, and I’m so happy that you have a recipe for the hangover soup with napa too! I loved her so much, and when I make bone broth, and I see a bowl of that milky white broth in front of me like when I was a child – it brings back memories of her love & how it carries on, even now. Your step-by-step guides helped me lots. You are so kind (and pretty!) and knowledgeable – watching your videos, I feel like I have an encouraging new friend, holding my hand through the process! I’ve just bought your book, too. I am wishing you all the best, you deserve it! Posted July 7th, 2016 at 9:30 am | Log in to reply. What a touching story it is! You were missing your grandmother’s bone soup and searched the recipe online and found my website! Now you can make this soup! The bone soup your grandmother made was very special to you because it was not only delicious but it contained her full love for you. By the way, I used to live in Gwangju, too! Posted July 1st, 2016 at 1:21 pm | Log in to reply. The directions indicate fish sauce but there is none listed in the ingredients. How much to use? Posted July 3rd, 2016 at 2:20 am | Log in to reply. in the video maangchi said to use 1 tbs fish sauce. Posted July 7th, 2016 at 9:10 am | Log in to reply. Posted June 22nd, 2016 at 6:43 pm | Log in to reply. This turned out great! It has a miso-like flavour to it; very mild. I paired it with kimchi, soy chicken, spicy cucumber salad and tea. Posted June 26th, 2016 at 6:23 am | Log in to reply. You made a great meal! It sounds very delicious! Posted June 20th, 2016 at 3:29 pm | Log in to reply. It looks so delicious and quite easy to make, I can’t wait to try this recipe! I’ll make it for my family this week, I hope they’ll like it. This recipe was originally posted on June 16, 2016 at 9:38 pm by Maangchi. It was last updated on July 7, 2016. The video was watched 726,963 times on YouTube & has 13,440 likes!